Congress’ effort to solve the multiemployer pension problem is underway. The public hearings of the Joint Select Committee on Solvency of Multiemployer Pensions began in April. As an organization, it has been a top priority of ours to be actively involved in Washington, D.C. lobbying on behalf of musicians around the country for legislation that would help our pension fund. The legislative process can be very complicated and the problems affecting multiemployer pension funds are very complex. With that in mind, MPS wants to provide a quick and easy way for musicians to stay up to date and easily understand all aspects of the legislative process that the Joint Select Committee will be dealing with moving forward. So MPS is launching a new blog called The Butch Lewis Watch which will be an ongoing commentary on Congress’ effort to solve the multiemployer pension problem. Written by MPS legal counsel Jonathan Kantor, the blog will be regularly updated with any and all relevant information. Our very first installment today covers the first public hearing of the Joint Select Committee. We hope you enjoy the blog. In a stinging defeat for the Democrats, Senator Sherrod Brown (D-OH), who is the co-chairman of the Select Committee on Multiemployer Pensions and one of the key negotiators to craft new legislation, has agreed to severely narrow the Butch Lewis Act to a small category of plans. According to a statement from Brown’s office, “We have amended the bill to limit it to critical and declining plans as of the date of enactment and any critical plan as of enactment below 40% funded with an active to inactive ratio below 40%. MPRA plans and some currently insolvent plans remain eligible for the program.” In plain English, this means that the loan assistance program under Butch Lewis is now beyond the reach of the vast majority of multiemployer plans like the AFM-EPF. The Select Committee on Multiemployer Pensions conducted a hearing yesterday and made clear that it would now turn to crafting a legislative solution to the multiemployer pension crisis. Senator Sherrod Brown (D-OH) stated that he and the Chairman of the Select Committee, Orrin Hatch (R-UT), had agreed that beginning next week, their respective staffs would be empowered to “get serious about negotiations,” to enable the Select Committee to “get close to real solutions in September.” Hatch added that the Select Committee will come together on a bill and that it would be to no one’s liking. The hearing gave little indication of what form the compromise might take. However, one possibly significant indication came when Chairman Hatch praised the testimony of Timothy Lynch, a lobbyist for business interests in Washington DC. Lynch has been working closely with the US Chamber of Commerce, a business lobbying group which actively supports the proposals of the NCCMP. The NCCMP is a powerful lobbying organization for multiemployer plans that wants to make the loan assistance program under Butch Lewis beyond the reach of plans like AFM-EPF. And they want to make it much easier for trustees to cut pensions when they want to. Mr. Lynch, in his testimony, voiced frustration at how slow and cumbersome it was for trustees to get pensions cut under current law. The Joint Select Committee on Multiemployer Pensions held a field hearing in Columbus Ohio on Friday July 13. The comments from the lawmakers made clear that unless there is more vocal support from Union members and retirees, the Butch Lewis Act is in trouble. The Butch Lewis Act would extend government guaranteed loans to plans like AFM-EPF, avoiding any necessity for cuts to accrued pension benefits. As many of you know, the Butch Lewis Act would extend government guaranteed loans to plans like AFM-EPF, avoiding any necessity for cuts to accrued pension benefits. But a powerful lobbying organization that purports to represent the interests of multiemployer plans like the AFM-EPF wants to make the loan assistance program under the Butch Lewis Act beyond the reach of plans like AFM-EPF. And they want to make it much easier for trustees to cut pensions when they want to. That lobbying organization is the NCCMP. As you may recall, NCCMP is the trade association in Washington for multiemployer plans. It was instrumental in the formulation of MPRA, the 2014 law that allows trustees to cut accrued pension benefits. 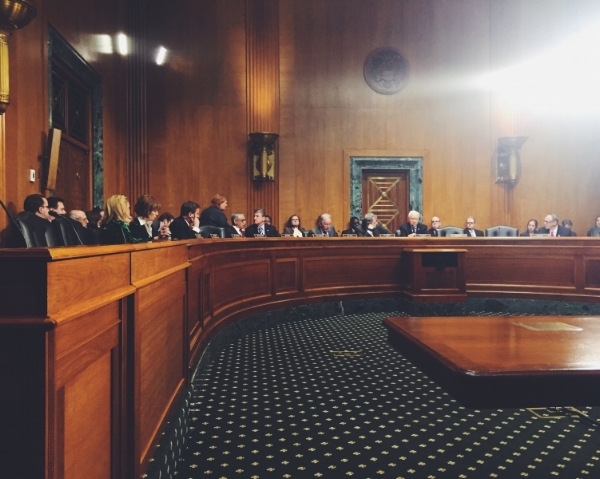 The Select Committee on Multiemployer Pensions conducted its third hearing yesterday and heard from two key witnesses who voiced support for the concept of government-sponsored loans as a means of shoring up failing multiemployer pension plans. However, the panelists also stated that they believed workers’ pensions should also be cut as part of the deal. The two key panelists were Chris Langan, a finance executive with United Parcel Service, and Aliya Wang, Executive Director of Retirement Policy for the United States Chamber of Commerce, a lobbying organization which represents the business sector. UPS made its government loan proposal in 2017, under which worker pensions would be cut up to 20%. The U.S. Chamber of Commerce came out in favor of government-sponsored loans several months ago, joining together with the NCCMP, which also supports the loan program. (As you may recall, NCCMP is the trade association in Washington for multiemployer plans. It was instrumental in the formulation of MPRA, the 2014 law that allows trustees to cut our accrued pension benefits.) However, the NCCMP has also proposed that government loans not be made available to plans like AFM-EPF. On May 17, the Select Committee on Multiemployer Pensions held a two-hour hearing on the Pension Benefit Guaranty Association (PBGC). The sole witness was Thomas Reeder, the current head of the PBGC. On April 18 the Joint Select Committee on Multiemployer Pensions held a two-hour hearing at which the panel heard from two experts who provided a briefing on the history and dimensions of the multiemployer pension problem. By design, there was little discussion of possible legislative fixes to the problem. The panel wanted to understand the problem first. The questions asked by the Senators and Congressmen included basic questions of how multiemployer pension plans are governed, how plans do actuarial projections, and the assumptions used in those projections. One area that received attention from the Republican side, particularly from Congressman Schweickert (R-PA), was the investment return assumption. Another area of questioning was the financial condition of the Pension Benefit Guarantee Corporation. Many lawmakers stated that the problem with multiemployer pensions was getting worse and there was a need to act soon.